Five new caps have been named in the Manu Samoa rugby squad to play tests against France, Georgia and Canada in November. RNZ reports locally based prop Nephi Leatigaga and midfielder Opetera Peleseuma have been rewarded for their form with Samoa A.
Otago prop Yoshishisa Sasagi and North Harbour lock Chris Vui have impressed in the New Zealand provincial competition while Perpignan loose forward Genesis Mamea is also set for his international debut. Head coach Namulauulu Alama Ieremia was pleased with the mix of players selected. "Especially with some experienced players returning to the team. Also the debutants are rewarded for good form and with a view to the future," he said. "Of note and importance, are the players selected and non-selected through the scrutiny of the Samoa A program. It reinforces the significance of this campaign to screen our next level of players for test rugby. "This feeder pathway to Manu Samoa together with our professional contracted players overseas is critical for our future." D'Angelo Leuila and Patrick Faapale will contest the number 10 jersey, with Tusi Pisi among eight players ruled out through injury, while Japan-based duo Tim Nanai-Williams and Faifili Levave made themselves unavailable. 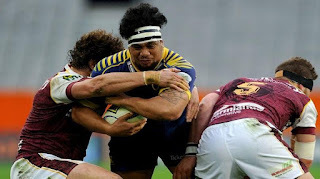 Despite missing a number of key players, including Motu Matu'u, TJ Ioane and Alapati Leiua, the 33 man squad does feature a recall for Stade Francais utility back Paul Williams, who last played for the Manu in 2013. Namulauulu has also recalled English-based duo Kahn Fotuali'i and Anthony Perenise, who are poised to play their first test since last year's Rugby World Cup. "We need our experienced players to help win test matches in the northern hemisphere. Their familiarity with playing conditions and the opposition is key for our younger players to learn from," he said. "Throughout our injury list, there are key experienced players unavailable. This will test us but it's an opportunity for others to make their claim. I'm excited and looking forward for Manu Samoa to once again come together and represent our country with pride".